Running Press Adult, 9780762450404, 256pp. Want to know the secret to growing gorgeous hair or how your favorite celebrities have such flawless skin? Introducing the power of food into your beauty routine in a whole new way, you'll uncover the recipes that promote beauty from within (with beauty-boosting foods you'll salivate for!) as well as topical DIY beauty recipes (for facial masks, body scrubs, and more that are, well, good enough to eatliterally!). 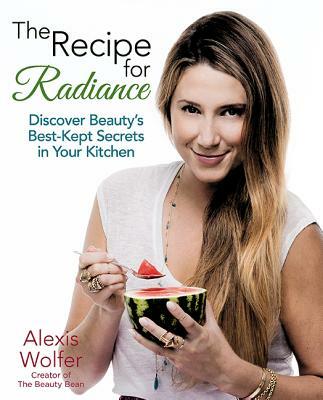 Dubbed the Female Beauty MacGyver” by Access Hollywood, Alexis Wolfer shares with you 131 easy, all-natural, affordable, and effective recipes that feed your beauty. Combining the best recipes from her personal archives with DIY beauty secrets and food recipes shared with her by chefs, beauty editors, and celebrities (including Kristen Chenoweth, Brooklyn Decker, Vanessa Williams, Molly Sims, Byrdie Bell, Donna Karan, and more), The Recipe For Radiance will take you into your kitchen to discover the food-based beauty secrets even the most well-pampered women rely on to look their best. Be prepared to cook yourself beautiful, all the while saving money on products and keeping your beauty routine chemical free. Alexis Wolfer is the founder and editor-in-chief of TheBeautyBean.com as well as a beauty and lifestyle expert as seen on programs such as The Today Show, E! News, Access Hollywood, and The Doctors. When she's not testing out all of the newest beauty products, she's in her kitchen making her own. She currently lives in Los Angeles.